Beloved Educator Passes; Fight for Justice Goes On! Pedro Santana has lost his fight with cancer. During his brief tenure in East Ramapo he touched many lives. I was proud to call him my friend. The quality I like to think made him so unique was his courage to do the right thing. I try to be more like Pedro every day. Pedro is survived by his wife, Angie, and their two children, Alexa and Hudson. A memorial service, will be held May 13 at 6 p.m. at the Lafayette Theater in Suffern. Clergy Group to Cuomo: East Ramapo Governance is Broken! Judge sides with East Ramapo over Yeshivas, but board votes to ‘settle’, awarding millions in credit. Advocates for Justice needs your help! The next East Ramapo Underground Radio Show is this Friday, April 11, 2014 @ 10 o’clock on WRCR-1300AM. The group plans to visit Albany and hopes to meet the Governor face to face later this month. One member of the group, Uri L’Tzedek (Awaken to Justice), has created an online petition for Jewish Citizens to support the mission of the group. 2) Judge sides with East Ramapo over Yeshivas, but board votes to ‘settle’, awarding millions in credit. However, at the last board meeting, the school board voted to “settle” with the schools, awarding not just the whole amount the judge just said they didn’t owe but also other credits totaling over $2.5 million dollars. East Ramapo ready to grant credit in school’s sale. The East Ramapo board’s “desire to resolve and settle … to avoid the risk, uncertainty, continued expenses and inconvenience” when it comes to ultra-Orthodox Jewish schools and families presents a stark contrast to the legal stance they have taken towards public school parents and the state education department. They file appeals when they lose and appear willing to spend any sum when facing public school advocates in court. But when the opponent is a yeshiva even when the judge has said they don’t have to pay, they settle!!! As reported in the Journal News ‘East Ramapo’ play aims to help ease friction in district , The new play by Mark Judelson has been a big hit. You have two more chances to catch it, at CEJJES in Pomona (Directions) this Saturday at 2 PM, and at the Kurtz Center in Spring Valley on April 28 at 7:30 PM. 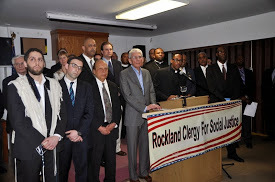 Rockland Clergy for Social Justice will hold a press conference on Tuesday, April 8 at noon, at the First Baptist Church located at 3 Hoyt Street in Spring Valley, NY. More than 90 rabbis, ministers, pastors and imams from Rockland County will be calling for Gov. Cuomo to intervene in the governance of the East Ramapo School District. Speakers will include Rev. Weldon McWilliams IV, PhD of the First Baptist Church in Spring Valley; Rabbi Adam Baldachin of the Montebello Jewish Center; Rabbi Ari Hart of Uri L’Tzedek (Orthodox Social Justice); Pastor Joel Michel of the French Speaking Baptist Church in Spring Valley, and Azeem Farooki of the Islamic Center of Rockland. The East Ramapo board has ignored NY State Education Department directives concerning its improper practices in violation of NY State and Federal law. Rabbi Adam Baldachin of the Montebello Jewish Center framed the issue as a moral obligation: “We believe that all of our children have the right to an educational experience which sets them up for a successful future. It is upon us as clergy members to make sure that this moral right is granted. We cannot be silent while students in the East Ramapo School District are denied the right to thrive”.